yesbashtiahwrites: You Kahwin Dengan I, You Dapat Duit. You Kahwin Dengan I, You Dapat Duit. Imagine getting married and receiving incentives out of it. Cool, right? Sudahla tambah isteri, dapat duit lagi~ Heaven lah for men. For Malaysians, I’m sure you’re aware already of this issue. 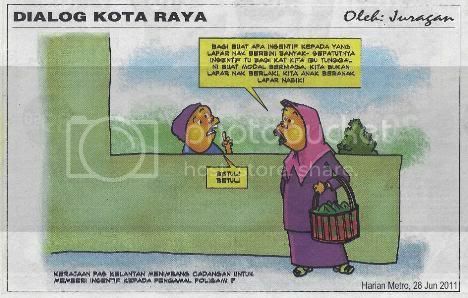 A few days ago, Kelantan’s government suggested that any man in Kelantan who took a widow as their second wife would be given an incentive. When I first heard that, I was outraged! VERY outraged! It’s as if those single mothers are THAT desperate of having a husband until the government had to give an incentive to man who marry them. What’s the difference between them and prostitutes then? Okay this might be way too harsh but come on, we women are not.that.desperate.for men. When the government offered incentives to those who took widows as their second wife, somehow it also questions the real intention of the man marrying the widow. "Abang kahwin dengan Yah sebab nak dapat duit ke sebab nak jaga Yah dengan anak-anak Yah ni? Cakap bang, cakap!" But still, it just doesn't seem right to me. I think it down grades single mothers out there. It's like they are too desperate, too hopeless to live alone that the government have to pay men to marry them. Someone is brave enough to voice out his opinion, though. Thank you Juragan, the cartoonist. Now I know someone still makes sense in this world. Bagi buat apa insentif kepada yang lapar nak berbini banyak-sepatutnya insentif tu bagi kat kita ibu tunggal ni buat modal berniaga. Kita bukan lapar nak berlaki, kita anak beranak lapar nasik! the comic said it right. Pika: I totally agree with you pika! GG: Such an idea, right..